The panels were commissioned by Domenico Lion who had held temporary membership of the Venetian Senate in 1356 and 1357. Traditional iconography is set aside and the airy, three-quarter length figure of the Virgin is moved from the centre to leave more space for the angel in the act of making his annunciation. In the foreshortened image above the Virgin's head the Eternal Father seems almost to be launching the dove forwards. The subtle play of physical poses and spiritual attitudes achieves a life-like quality never before seen in Venice, and in the figures of the saints in the side panels too the rhythms are sinuous and relaxed. The colour, not attempting to obey the coded decorativism of Veneto-Byzantine tradition, takes on a lively pmbre and a refined range of shadings: blues, reds and greens paling into pearl-grey and light-pink reflections, fading into ure luminosity. 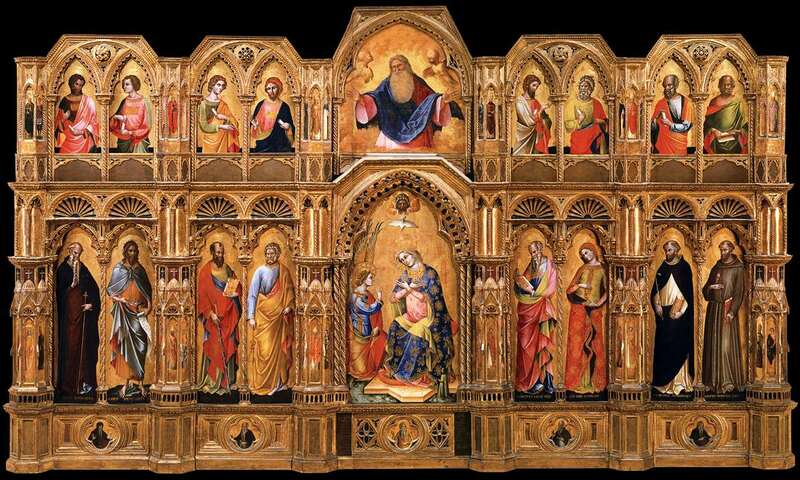 Examples of this formal refinement, where already the fundamental characteristics of Venetian Gothic style are clearly present, can be seen in the half-length figures of saints in the upper order of the polyptych; a whole range of human types caught in a variety of different poses.